In object oriented programming State Pattern is one of the way to implement Finite State Machines. This pattern falls under Behavioral Design Patterns. In object-oriented programming, State Pattern is one of the ways to implement Finite State Machines. This pattern falls under Behavioral Design Patterns. When in our software, an object can change between multiple possible states and change its behavior according to the state, then, this type of problem can be easily solved using Finite State Machines, and this pattern helps us to achieve the same. Here, I’m taking the example of the Super Mario game. Most people are already aware of this nostalgic game. 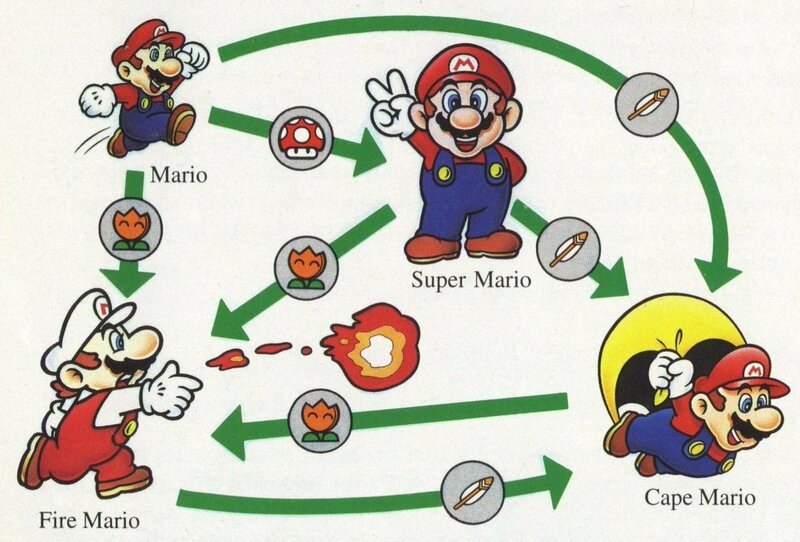 In this game, Mario changes his states and behaviour based on the events which occurred, which you can see in the below image which I got from Mario Wiki. Let’s observe states/behavior and events in above image. The following table demonstrates how the state changes with different events. Apart from the state change, coins are also earned on the occurrence of events. On every 5000 coins collected, one life will be awarded. Just to make it clear, Nintendo hasn’t open sourced the Super Mario source code yet. I am just taking the example to help you understand State Design Pattern, like in other articles in the series we will start programming with some code and will be refactoring it gradually. As you see in the output it is changing state on the occurrence of different events. On the occurrence of each event, a different operation can be executed based on current state of the object. For example, GotMushroom event -- if it occurs for SmallMario, the character would be changed to SuperMario, but if the same event occurs for SuperMario, it will remain the same. It may lead to confusion to write the same conditions in each method. To address the problem of approach 1, here I created a separate class for each State, which all are inherited from IState interface. 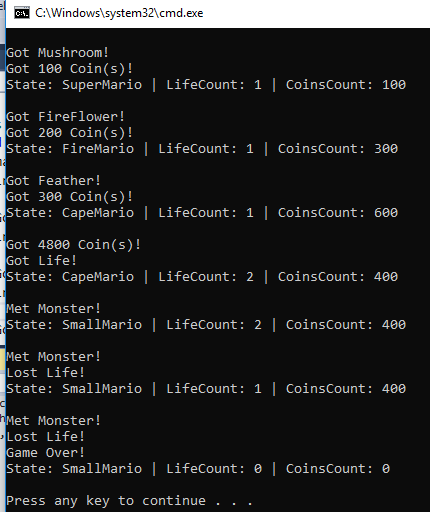 This interface contains respective methods for all our four events; i.e GotMushroom(), GotFireFlower(), GotFeather() & MetMonster(). All State classes are inheriting this. Now, before writing state specific code, we don’t need to check condition, because it’s being written for specific states. All 4 state classes are mimicking our State transition table shown above. Refer to the code. Everything related to states is within state classes now, but responsibility to create its object is still outside. Since our state classes having no variable/properties, all those are maintained in Mario class, so we can make state classes singleton. In event methods of all singleton classes, we will be passing current Mario object so states can be switched. Here, IState interface is changed accordingly to pass the Mario class object as parameter and inside Mario class there is no need to initialize all the objects. All state related logic is maintained within state classes now, and in the final approach, a singleton is used, which can be implemented in various better ways. Here, we have removed conditional duplicacy & new states can be easily added. Existing state logic can be easily extended without changing any other class. In game programming, this pattern is frequently used. Thanks for reading, let the suggestions/discussions/queries go in the comments.